123 pages of narrative, in thirteen chapters plus epilogue. 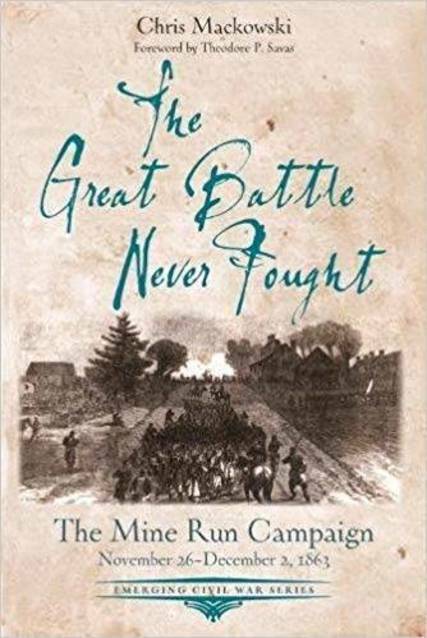 An Afterword by Ted Savas, featuring how he located the Payne’s Farm battlefield site. A ten stop driving tour with GPS coordinates. Appendix A, Rest, Soldier, Rest, by Mike Block, on the Army of the Potomac’s hospitals during the winter encampment of 1863-1864. Appendix B, I Suppose the Result Will Be a Pretty General Sweeping Out, by Ryan T. Quint, on the reorganization of the Army of the Potomac in the wake of the aborted Mine Run Campaign. Profusely illustrated with vintage and modern-day photos. No footnotes, no bibliography, no index. Chris Mackowski is the editor-in-chief of Emerging Civil War. See his author page here. Hello! I’m Harry Smeltzer and welcome to Bull Runnings, where you'll find my digital history project on the First Battle of Bull Run which is organized under the Bull Run Resources section. I'll also post my thoughts on the processes behind the project and commentary on the campaign, but pretty much all things Civil War are fair game. You'll only find musings on my “real job” or my personal life when they relate to this project. My mother always told me "never discuss politics or religion in mixed company”, and that's sound advice where current events are concerned. This site is more than a blog. Bull Runnings also hosts digitized material pertaining to First Bull Run. In the Bull Run Resources link in the masthead and also listed below are links to Orders of Battle, After Action Reports, Official Correspondence, Biographical Sketches, Diaries, Letters, Memoirs, Newspaper Accounts and much, much more. Take some time to surf through the material. This is a work in process with no end in sight, so check back often! Type in the keyword in the box below and hit "enter"